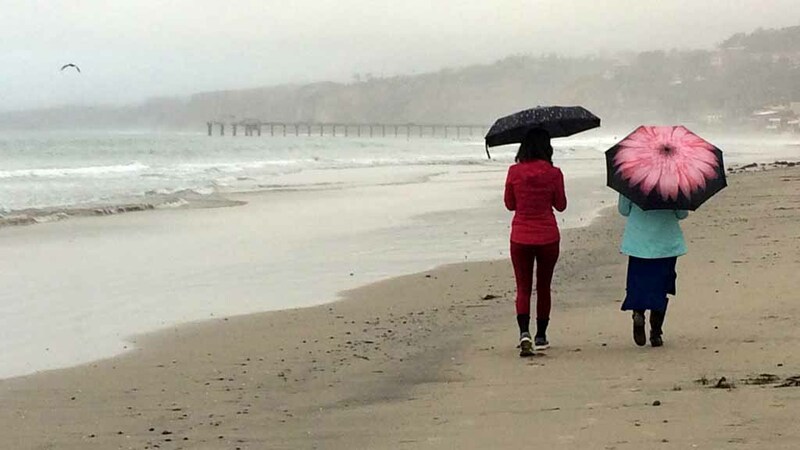 Light showers, brisk winds and a slight chance of thunderstorms are in the forecast Wednesday for San Diego County as a weakened spring storm moves through the region. Forecasters had initially expected a major storm dropping several inches of rain, and the San Diego County Water Authority had transferred water from nearly full Lake Hodges as a precaution. But less than half an inch of rain is now forecast. Anticipated rainfall amounts expected through Wednesday evening are .55 of an inch in Julian; half an inch on Mount Laguna; .45 of an inch in Alpine; .38 of an inch on Palomar Mountain; .27 of an inch in Ramona; a quarter-inch in the Miramar area; .21 of an inch in Escondido; .19 of an inch in San Diego; .14 of an inch in Oceanside; and .03 of an inch in Borrego Springs, according to the National Weather Service. Winds of 15 miles per hour with gusts of 25 mph are expected during the day along the coast and in the valleys, with gusts at the beaches ramping up to about 30 mph Wednesday evening. In the mountains, winds of 20 to 30 mph with gusts of 50 mph will increase slightly Wednesday evening to 25 to 35 mph with gusts up to 55 mph. Wind speeds will similarly rise in the deserts, from 15 to 20 mph with gusts to 30 mph to 20 to 30 mph with gusts of 45 to 50 mph starting Wednesday afternoon. Increasing winds and seas off the coast prompted officials to issue a small craft advisory that will remain in effect from 9 p.m. Wednesday until 5 p.m. Thursday. Forecasters said there would also be a slight chance of afternoon and evening thunderstorms over coastal waters. The storm system is expected to exit the region Thursday morning and will be followed by fair weather Friday. But forecasters said a second storm system could bring another round of showers this weekend.